The church site is next to the UOW Marketview Residence, opposite the Wollongong Police Station and Court House, and overlooks the City Mall and Crown Central Shopping Centre. There is a free Gong Shuttle bus (55A and 55C) in Wollongong which runs every 10 to 20 minutes. On Sundays, the 55A & 55C buses only run between 9:40am to 5:20pm. 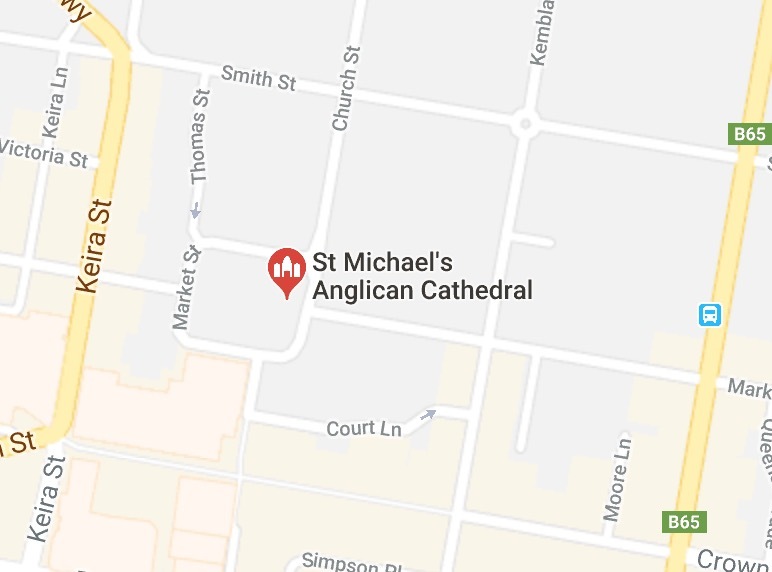 The closest stop to St Michael’s is Burelli Street. View the free bus route here. Alternatively, St Michael’s has volunteers who are willing to provide transport to and from Sunday church services. This has proven especially helpful for our international friends. If you’d like more information or require a lift to church, please contact Liam Shannon, via the office. There is limited parking available onsite (within the church grounds), including disabled parking spots. There are also paid parking meters in surrounding streets and parking stations nearby. On Sundays, we recommend parking in the Thomas St carpark, on the northern side of the church hall.